From Riverstone Industries comes the only affordable portable outdoor sink program in the market today. The RSI-S2 larger area work surface sink is a great sink that allows within minutes a fully function sink to be installed outdoors, all that is needed is a standard garden hose. With the Riverstone outdoors sink you can keep the dirt out of the house. Whether using it to clean dirt off shoes or boots, garden tools, paint brushes, kids hands, cleaning vegetables and herbs from your garden, or just about anything you need to clean the Riverstone Sink works great. This is also a perfect sink for cleaning and scaling fish. The large surface area allows for this coupled with the built in tool storage make this a great alternative to an indoor sink. The detachable hose reel holds up to 200 ft of garden hose. Made from food grade plastic with a UV protective coating to prevent sun damage from occurring. Large work space area - great fpr planters. Designed to be mounted on the inside or outside of the Monticello Greenhouse. Antiwind car shelter stabilizer strap for Everest car shelters with a width of 18'. Our recent winters with violent winds encourage the addition of stabilization straps to the ground for added security The set includes a strap and 2 stakes. Two kits are recommended for 20' long shelters. The permanent anchorage system for Everest car shelters is the ideal solution if you are installing your shelter on an asphalted surface, or paving stones. Installation instructions are included in the package. The combination of Everest permanent anchors with Everest antiwind stabilizer straps ensures the stability of your shelter in extreme wind settings. This elegant Glacier Bay cabinet design is sure to match any decor and endure the test of time. 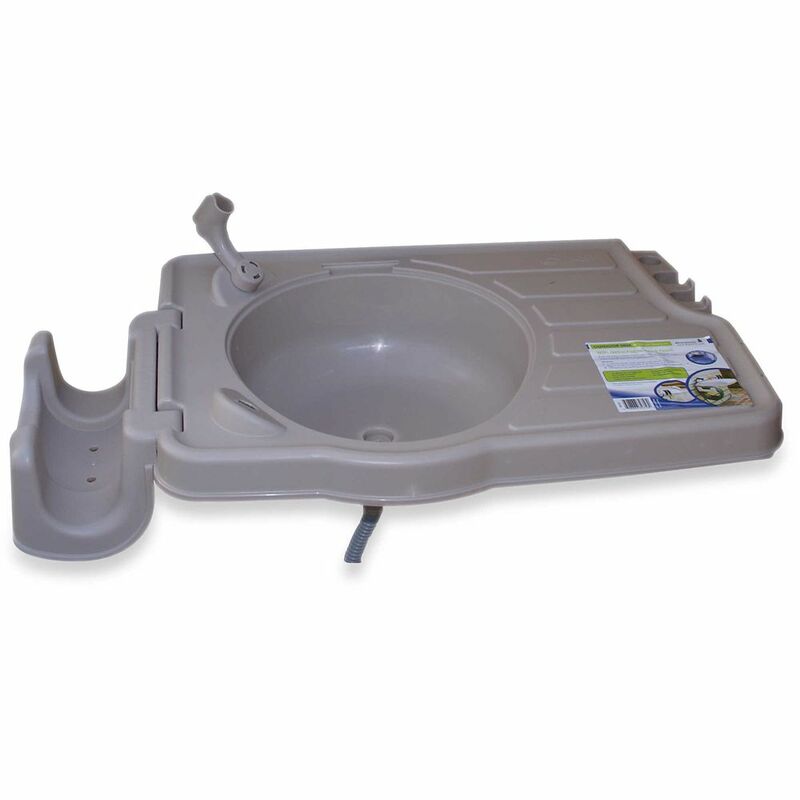 The Extra deep 14.5 ABS utility sink features a built in washboard to handle just about all domestic cleaning tasks and makes an excellent pet wash station. The Two-handle faucet offers a handy pull-down sprayer head. The large high gloss melamine clad cabinet with slow close doors and high gloss ABS sink are easy to clean and maintain and the cabinet offers plenty of space to neatly store cleaning supplies out of sight. Designed to reinforce the stability of temporary outdoor canopies, sun shelters, carports or play sets. Includes 8 steel anchors and 8 sections of 10 ft. long rope. Outdoor Sink For Greenhouse- Large From Riverstone Industries comes the only affordable portable outdoor sink program in the market today. The RSI-S2 larger area work surface sink is a great sink that allows within minutes a fully function sink to be installed outdoors, all that is needed is a standard garden hose. With the Riverstone outdoors sink you can keep the dirt out of the house. Whether using it to clean dirt off shoes or boots, garden tools, paint brushes, kids hands, cleaning vegetables and herbs from your garden, or just about anything you need to clean the Riverstone Sink works great. This is also a perfect sink for cleaning and scaling fish. The large surface area allows for this coupled with the built in tool storage make this a great alternative to an indoor sink. The detachable hose reel holds up to 200 ft of garden hose. Outdoor Sink For Greenhouse- Large is rated 5.0 out of 5 by 1. Rated 5 out of 5 by Haley from I've had this sink for over a year and it has kept up perfectly! It sits right on the side of my ... I've had this sink for over a year and it has kept up perfectly! It sits right on the side of my my shed and is super sturdy!